Tour visits: Goreme Open Air Museum, Devrent Valley, Paşabağ Valley and more. Good morning! We hope you had a great night in Cappadocia. 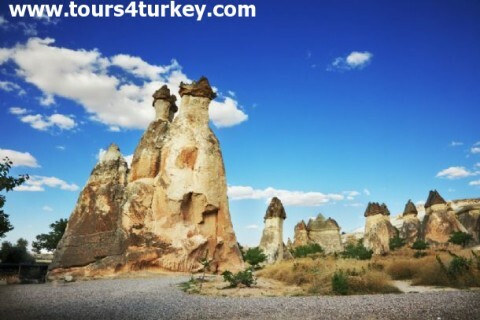 Now it's time to have another amazing Cappadocia Tour with Tours4Turkey. Our first destination today is Kaymakli Underground City. The Christians hid from the armies of Rome and the raids of hostile tribes in these self sufficient cities in which there were halls for stocks of crop, barns, rooms, kitchens & ventilation channels. Next we will visit Uchisar Castle, Avcilar, and Pigeon Valley. After the tour our team will take you to airport for your flight back to Istanbul. And on arrival to Istanbul we will meet you and make your transfer to your hotel. 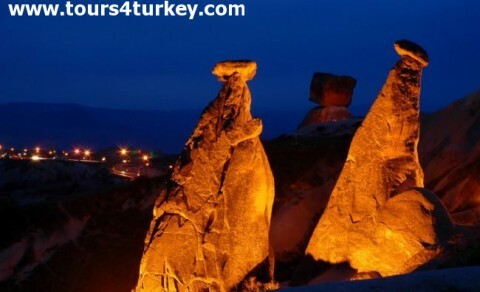 At Tours4Turkey we aim to make your trip a lifelong memory. Breakfast at hotel, lunch on the tour. Pickup from cave hotel in the morning for the tour. Transfer to airport after the tour. Greeting in Istanbul airport and transfer to your hotel. All transfers by air-conditioned, non-smoking allowed vehicle. Available any day of the week all year round If you wish to join the Hot Air Balloon Flight on the second day of the tour at sunrise, please let us know in advance so that we can guarantee a flight for you.